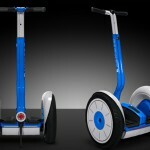 Segway has continued to “move forward” from its original product – the Segway Personal Transport (PT). 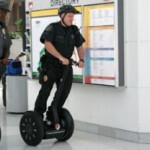 They now have come out with the Segway Personal Transporter x2. 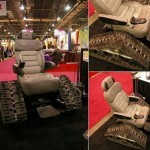 This product is designed to provide enhanced personal transport performance on rugged terrain. x2 Police – includes accessory bar for mounting lights and sirens. x2 Adventure – has handlebar bag for water bottle and other items. x2 Golf – comes with a golf bag carrier attachment.